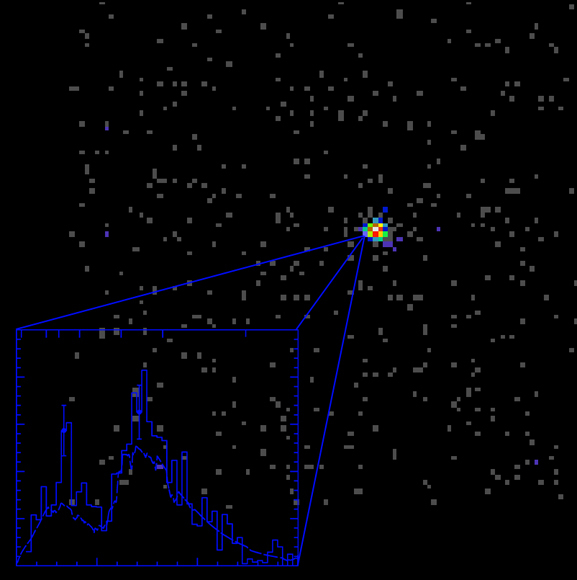 This composite image shows the X-ray spectrum and CCD image of the gamma-ray burst (GRB) known as GRB991216. An international team used Chandra to observe iron emission lines from ejected material surrounding GRB991216, the first time emission lines associated with GRBs have been unambiguously detected and their properties precisely measured at X-ray wavelengths. These data strengthens that GRBs are the result of a "hypernova," a gigantic star collapsing on itself under its own weight. While GRB afterglows have been studied in the optical, radio, and X-ray regimes for some time, high precision X-ray observations were needed to detect the dense, massive medium that would exist if the scenario of a massive progenitor were true. With Chandra, the scientists believe they are seeing the iron emission that is predicted if the surrounding medium becomes heavily ionized and recombination takes place after being hit with the radiation produced by the GRB and its afterglow. 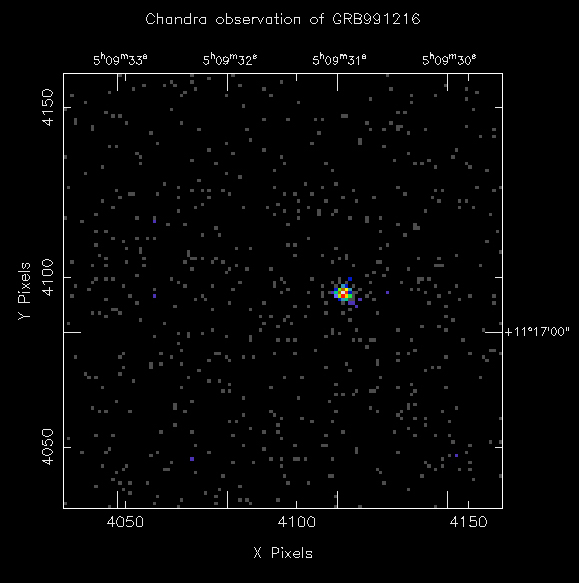 Chandra observed GRB991216 on December 18, 1999, using the High Energy Grating Spectrometer (HETG) in conjunction with the Advanced CCD Imaging Spectrometer (ACIS) for 3.4 hours. Coordinates (J2000) RA 05h 09m 31.20s | Dec +11° 17' 06.00"